Author Brent A Harris turns reviewer as he delivers his verdict on the pre-historic pulse-pounding pulp prose that is Groom of the Tyrannosaur Queen, by Daniel M Bensen. Time travel, alternate timelines, dinosaurs. That was more than enough to interest me in Daniel M Bensen’s Groom of the Tyrannosaur Queen. And, while the title implies that it has more in common with Taken by a Pteranodan than pulp sci-fi, (other than a couple salacious scenes and some bits of violence befitting a Zack Snyder Batman film), Bensen crafts a rather high-brow look at a lost colony, complete with dimensionalities: language, ethics, and culture/religion. In other words, it is not a caveman-meets-woman/angel-of-the-future-love-story—well, it is that, but it also has a depth, which is unexpected in the day of self-published works. Trals Scarback is Conan the Barbarian with a brain, the Grand Admiral Thrawn of the Mesozoic. He lives for conquest, revenge, and to bathe in the blood of those who would enslave him. In other words, he’s a pretty decent guy. His plan for Cretaceous conquest is hampered a bit in the beginning by his capture and the untimely arrival of a time machine. Out of this ‘Ship of Years’ emerge four travelers, led by Andrea, a former special forces operative in a future-gone-mad by peace and bureaucracy (which just proves my theory that DMV employees are far more effective weapons than armored tanks). The four time-travelers wear super-powered suits that make them all but invincible weapons in an age where nearly everything can kill you. Thus, Bensen begins an engaging dialogue which asks, what is true power and what is leadership? in a narrative that can sometimes plod along like a long-necked sauropod or dart like a razor-toed deinonychus, until it crashes like a T-Rex through an un-electrified fence in a twisting climax. The first half of the book feels unfocused as there are too many characters and too many short snippets that make the reader ask: who is the story supposed to be about? and why should I care about all these people? This is straightened out by the last half of the book as plot lines resolve and characters are… well, just like in Walking Dead, it is not the dinosaurs you have to worry about—it’s the people. As the herd is thinned, the narration, combined with the real-feel of this paleo-world, culminates in a much better-than-average story for a self-published work—particularly from a debut novelist. There are real stakes, real bits of character growth, and real meaning to what is essentially a fun and pulpy Sci-Fi story. There are so many times a less skilled author would have made a mistake, but Bensen deftly sidesteps. 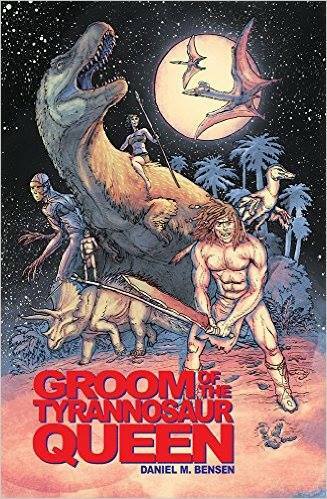 Groom of the Tyrannosaur Queen is a refreshing dime-store novel with thematic purpose that ultimately overcomes an unfocused beginning to deliver dinosaurs (with feathers! ), cavemen with culture, and a fierce warrior queen astride a rampaging T-Rex.